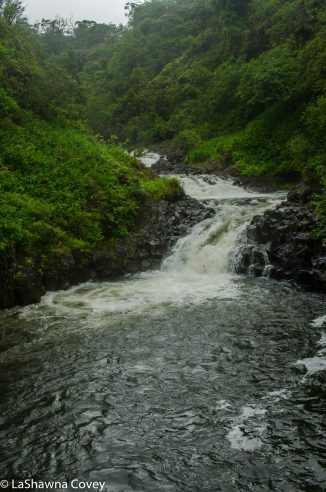 When I was researching my trip to Maui, my guide book touted the Hana Highway as one of the “must do’s” on Maui. The 35 mile drive along Highway 360 is considered one of the most iconic drives in the world, since the windy, twisty road is like driving through a remote tropical paradise, like Jurassic Park (assuming it is not overrun with tourists when you do the drive). 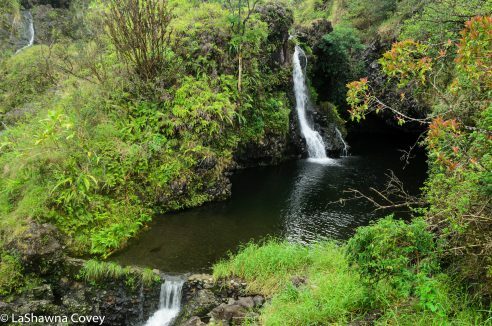 A 35 mile one way drive to Hana doesn’t sound like that much, but the trip turns out to be longer than you might think. First off, this road is one of the curviest roads I have ever driven. Supposedly it has 600 turns, though I didn’t really keep count. What I do know is you will probably never go faster than 35 mph for very long, because you are always slowing down for a tight turn, and there are many, many one lane bridges that you have keep a watch out for oncoming traffic. Plus, this is not a road you want to speed. 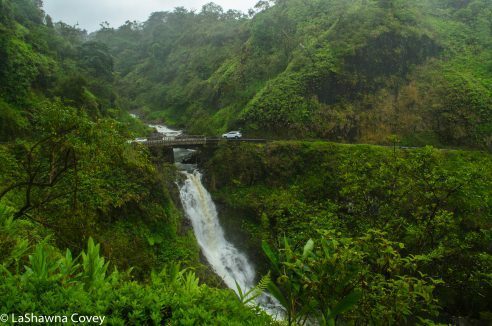 The drive to Hana is very much about the journey and not the destination, because while the drive to Hana (and beyond) is so beautiful, there is not anything exceptional in the village of Hana. 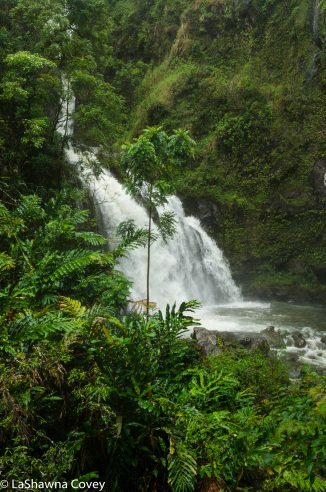 There are so many stops of exquisite nature on the road to Hana that it seems like every few minutes, you will be stopping at something to admire and gawk. 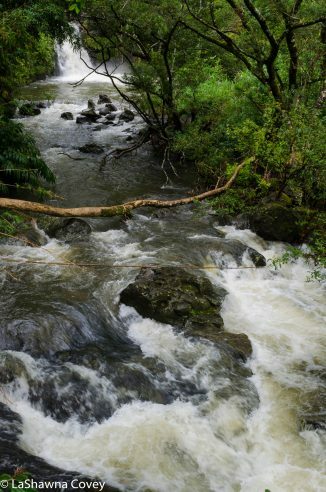 Most people do the Hana Highway as a day trip, and it is entirely possible to do it in one day. However, know that unless you start very early and finish late, you will probably not be able to see everything (assuming you want to see as much as possible), so you will have to pick and choose what stops are the most important to you, or at the bare minimum, not allot much time at each stop. Since Mom and I weren’t in any hurry, we decided to make the trip out of Hana into a two day affair and spend the night at Hana. That allowed us to leave a bit later in the morning, thus letting any sort of tourist crush get ahead of us, and then take our time on the way out to see everything we wanted to see, knowing that we would have a full day to see anything we missed on the way back. The day we drove out to Hana was warm, but rather cloudy and rainy. Everything still looked like a lush, green, very wet paradise, but we had to balance it with taking advantage of the breaks in the rain, and in some case, going out to the views myself and taking all the pictures while Mom stayed in the nice, dry car. The nice thing about all the rain though, is that the waterfalls were full, and there were just so many waterfalls to stop and gush at. We undoubtedly would have missed some critical stops along the highway if it was not for my trip making guide book, Maui Revealed. There are some signs for a few of the sights, but for many of them, you have to know what to look for, because they are easy to drive by and miss. The nice thing about this book is that all the sights are listed in relation to the highway mile markers, so you have a pretty good idea when something is coming up. The ONLY problem we ran into, is that some of the mile markers from 9-16 seemed to be missing, though maybe that problem has been corrected since we visited. That resulted in us having to occasionally guesstimate where to stop, but for the most part, we were able to figure it out. There are so many waterfalls to enjoy that honestly some of the waterfalls start blurring into the next, and it can get a bit difficult to keep track of where you are. If you really want to know which waterfall you are at to remind yourself later, it’s probably best to write down the photo number and the location. Every time you get out of the car, you can barely see any surrounding roads, so it just seems like you are alone in a lush, super green, and while we were there super wet paradise. When we were there, all the foliage around us was thick and green, broken up only by the white of waterfalls, the black of the seaside cliffs and the blue of the sea. And for the most part, we were on our own. I think it was because we were there in the off season, mid week, and it was raining, but we avoided the crush of tourists that are certainly possible during this drive. 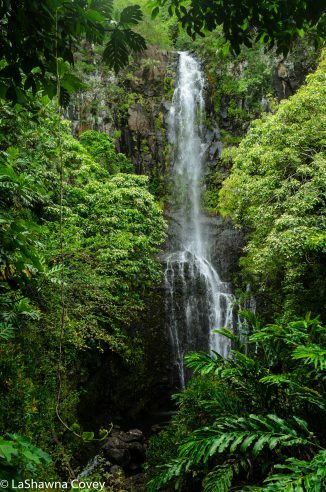 One of the first waterfall highlights we stopped at was Lower Puohokamoa Falls, just short of the 11 mile marker. There is a tiny pullout on the sea side of the road, and it is easy to miss (look for the telephone pole), so we had to turn around and go back. Right by the pole, there is a muddy trail (assuming it has been raining like it often is) that leads you down the hill. At first, I wondered if the short hike was worth it, but other persons I ran into said to keep going, because it is worth it. You will know when you are in the right place, because the foliage opens up and you see the falls amidst the greenery. 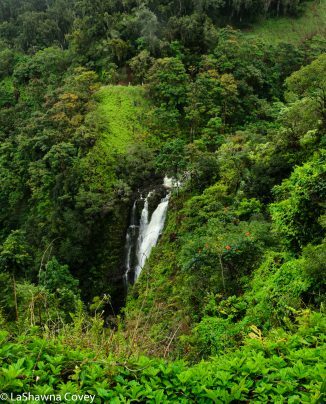 What makes the Hana Highway such a fun drive is that a good chunk of the waterfalls are basically just off the roadway, so you can see them very easily from the road, or with just a short walk. The bad thing about all of this goodness, is that there are few very parking spots alongside the road, and the road is often narrow. You can often find a pullout for a car or two near the bridges, but other times, you might have to park a bit away from the waterfall and then walk along the road back to the site. That is when it is nice that most people (or at least most tourists) drive pretty slowly along the highway. 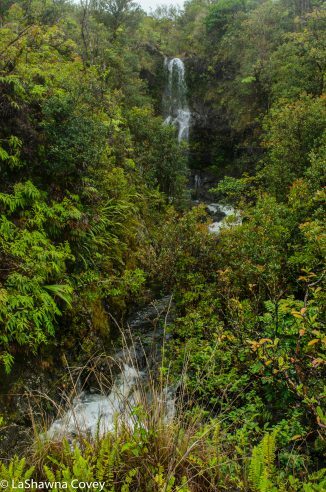 One of the easily photographed waterfalls are the Upper Waikani Falls (sometimes called the Three Bears Falls), which are located between the 19 and 20 mile markers. These falls will vary fairly dramatically, depending on the time of year and the flow of water. This particular time, the water was flowing pretty well, so it all looked like one falls. Just short of the 21 mile marker, we drove by the Wailua Iki Falls. The falls viewable directly off the road are pretty, but the true majesty of the falls isn’t viewable until you walk (or drive) up a little further on the road toward Hana. The road twists a bit and rises a bit in altitude, and that vantage point shows the truly wondrous view of the lush valley and full falls above and below the road. That view is the title photo for this blog post. 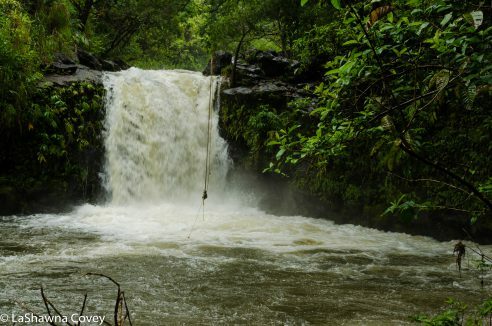 A quick and easy stop for some light and easy waterfall viewing is at Pua’a Ka’a State Park, located between mile markers 22 and 23. Unlike most stops along the Hana Highway, there is plenty of parking and even a bathroom. The waterfalls are small, but still pretty to enjoy for a bit. The Hana Highway doesn’t actually end in Hana. Highway 360 continues, though the mile markers shift and start counting down from mile marker 50 once you get past Hana. On the first day of our trip, we just went as far as Hana, because we were staying overnight. I am glad we made the choice to stay overnight, because it gave us the opportunity to just relax and take it all in. The last major waterfall we stopped at on the Hana Highway was Wailua Falls. We saw it the next morning as we were driving out to Haleakala National Park to see the sights there and do some hiking (which will be in another blog post). 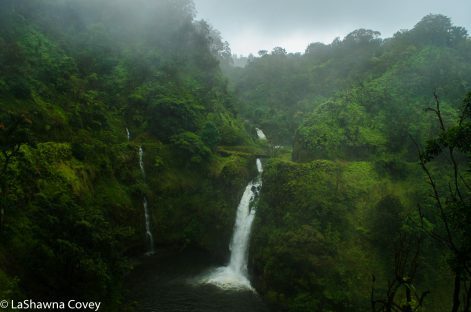 Wailua Falls is right off the road, right around mile marker 45 and is the bridge over Wailua Stream. This is a major stop on the highway, so there is a decent sized parking lot. However, since it is a popular stop, many tour vans and buses will stop there, so don’t be surprised if you see a crowd. Luckily they usually don’t stay there long and will disperse. 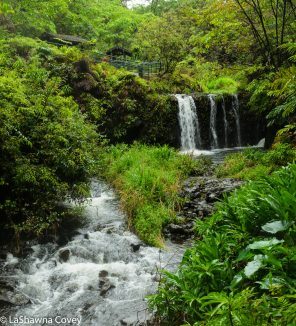 If you love waterfalls, you should just adore the Hana Highway. There are just so many waterfalls in so many different configurations, and none of the waterfalls look the same. 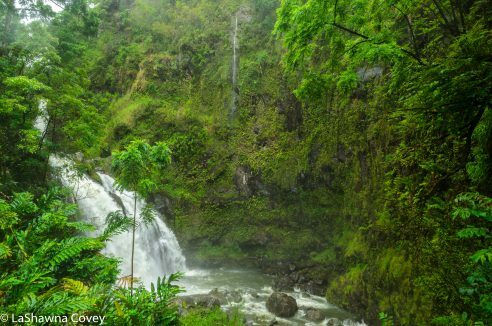 This entry was posted in Photography, Travel and tagged Hana Highway, Hanawi Falls, Hawaii, Highway 360, Lower Puohokamoa Falls, Maui, Pua'a Ka'a State Park, Road to Hana, Three Bears Falls, Upper Waikani Falls, Wailua Falls, Wailua Iki Falls, waterfalls.